The Lenovo Vibe Z2 Pro that we told you about last month is now official, as Lenovo showcased it during an event in China. It doesn’t seem like it’s calling it Vibe Z2 Pro, though, for now referring to it as the K920. Regardless of its name, this device is a high-end one. It’s huge, too, as it sports a 6-inch Quad HD (1,440 x 2,560 pixels) display - although its slim bezels help a lot in keeping it fairly compact. The K920 runs Android 4.4 KitKat with Lenovo’s own software customization on top. It’s also got LTE, NFC, a quad-core Snapdragon 801 processor, 16MP rear camera with optical image stabilization, 5MP front-facing camera, and 3GB of RAM - all in a 7.7mm-thin body. Overall, the device looks pretty cool. 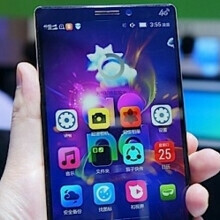 Engadget Chinese has a video presenting the Lenovo K920, and we included it in the slideshow below. This particular model is made for China Mobile, and we don’t know I there’s going to be an international version of the device. There’s also no word on when the K920 will be released, and neither for what price. But we’ll probably find out more about this soon. Wait for the Note 4 if you are wanting the SD805. Otherwise, it seems quite similar to what is leaking out about the Note 4. Why tegra 4? Sd800 is faster and more powerful than tegra 4. You probaly meant tegra k1. Wrong . A Tegra4 needs to be clocked 600Ghz lower than the S805 to preform giving the same performance. Like: S805 2.7Ghz, the T4 will be clocked at 2.1Ghz for it to be equilibrium. So if clocked the same as the S805 at 2.7ghz, it will be much faster. I want S810 or Tegra K1. That would be perfect. On a more serious note, what really lets this phone down is the UI. We need a Google Play Edition of this beast. You are a troll. I am here to troll you. The K900 using magnesium alloy instead of crappy aluminum. Unlike aluminum (which is cheap and not premium at all) Magnesium alloy is stronger than plastic. Very cool design! Software looks kinda cool too! It's camera hump makes it look like a 2010 phone. The Beast has arrived! I like the small bezels. But the body needs to be rounded in order to comfortably hold such a big phone. Square design doesn't help its large size. Lenovo k900 was a masterpiece.. I loved its design..
Holy s*** I want...I'll probably have relatives in China buy it and mail it over if the price is somewhat reasonable. I'm still holding out for a 20" 4K phone, come on Panasonic turn your tablet into a phone! "…but lacking 3G/4G with T Mobile…" Or VZW XLTE/LTE…. No international phones will ever work on Verizons network. Lenovo hasn't even said the bands that this phone will support. Some previous phones have had the bands required to connect to T-Mobiles 1800mhz 4G. That phone has got some junk in her trunk. I have a Lenovo K900 until now and it's still working. NOT ALL CHINESE PRODUCTS ARE LOW QUALITY remember that.